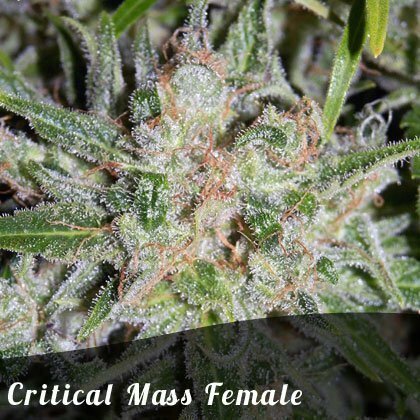 Dope seeds female Critical Mass cannabis is a massive yielding strain which is a reworked and improved version of Big Bud. Critical mass is a reworked version of a Big Bud with increased yields and stability. This is a large yielding strain with an equally high stone. It is the heaviest plant currently in production both indoors and outdoors with buds resembling the male genital protrusion of a giant donkey. Due to its heavy flower construction it can be susceptible to mould if the growing area is too humid. So be warned, and harvest on time. It has a genetic pedigree originating from a particularly heavy Afghani combined with the original Skunk #1. Characteristics: Short flowering period, earthy aroma, knock out stone and big yields!